A murderous bombing in Kabul reaches deep into the fabric of Afghanistan when a politician and local businessman is targeted by a bomber in Kabul. Caught up in a storm of deceit with a vicious streak at its heart is William Carver, a journalist for whom old habits die hard. Even in such dangerous times in Afghanistan, this is the time to make the news – not make it up - provided he isn’t engulfed and overwhelmed by vested interests. Us or them, it is the same story. Fight violence with violence, hold to hate and take revenge, match corruption with corruption. He is warned off the story from every direction. But be sure, William Carver will not waver as he seeks to find the Truth about this death. His instincts tell him something isn't right and with Karim, his Afghani interpreter and aide, he probes every local lead. Patrick, a junior producer, is sent from London to control the wayward Carver. It looks like powerful forces are colluding to ensure the real story never sees the light of day. 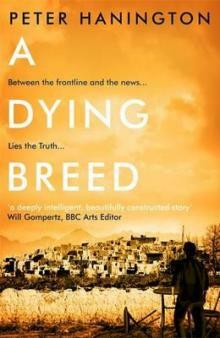 Set in a shadowy le Carre-esque world, A Dying Breed is about journalism in a time of war, about how hard it is to tell the stories that need to be told and how much easier it is not to.